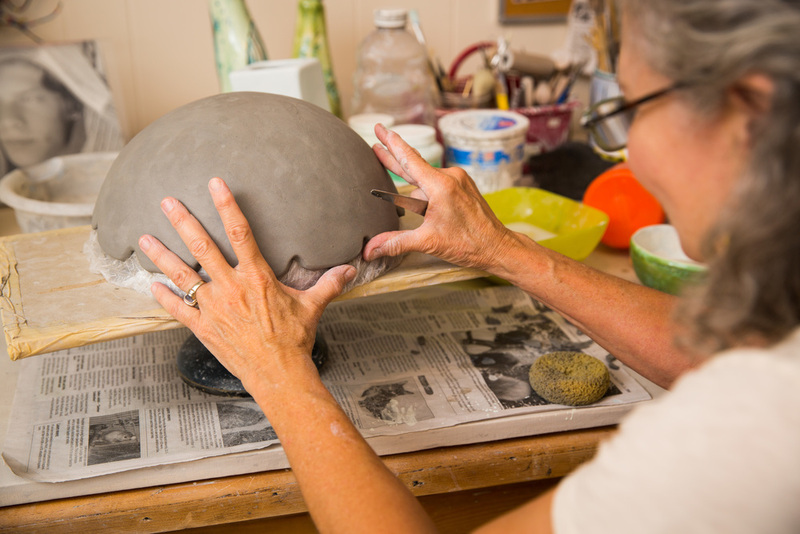 When I began my love affair with clay, I had no formal training. So for quite some time, I took advantage of local classes and workshops. Then I went on to spectacular craft schools – Penland School of Crafts and Arrowmont School of Arts and Crafts. And in 2001, I had the great fortune of being accepted as an Affiliated Artist with the McColl Center for Art + Innovation. I continued into a second program with the Center, which lead me into the enthusiast career I enjoy today. The form I most often use is the technique of stacking, which makes possible all kinds of patterns, color combinations and opportunities to play. In addition, color has always been an identifying element in my work along with flora and fauna images, stripes and dots, and of course black and white lines. I participate in various exhibits during the year, which you’ll see detailed on this site. The majority of my work is by commission for individuals, organizations and businesses, and I also work on special projects, occasional workshops and installations. When you see my work on this site or elsewhere, I hope you’ll share in the joy of every piece. All gallery images by David Ramsey.